Super quick and easy, these Caramelized Sweet Potatoes are a healthy alternative to traditional, sticky, marshmallow recipes. And they taste like candy! The only difficult thing about these delicious sweet potatoes was deciding on a name. I oscillated between Caramelized Sweet Potatoes and Candied Sweet Potatoes, but you can clearly see which was the winner. Candied Sweet Potatoes seemed appropriate, since they’re like good candy – addictingly delicious and quite irresistible! The only problem was what the traditional of Candied Sweet Potatoes brought to mind – overly sweet, sticky, gooey, loaded with brown sugar and/or marshmallows. Just try googling Candied Sweet Potatoes and you’ll see exactly what I mean. This healthy, delicious side would be out of place on a page like that. So I went with Caramelized Sweet Potatoes, and I’m quite certain you’re going to love them. They can be prepped in advance, then finished in under 10 minutes, right before serving. I use my Vidalia Chop Wizard to make the prep work even easier (see the Notes following the recipe for a tip on how to use the chopper). Once the sweet potatoes were peeled, it took less than 2 minutes to get them all chopped. The ingredients list is simple: sweet potatoes, olive oil, butter, honey, ground coriander and salt. The preparation is even simpler: combine all the ingredients in a pan with a splash of water. Bring the liquid to a boil, then cover and cook for 3 minutes. The potatoes are steamed a bit at first and then the cover is removed, allowing the water to cook off. That’s when the beautiful caramelization process takes place and the sweet potatoes are glazed with the delicious honey/butter mixture. See how easy it is? You’re done! Except to note the happy smiles when the family (or friends) take the first bite. Oh yes, just a warning: be sure to make plenty, as they’ll disappear before you can say, “Caramelized Sweet Potatoes”! The recipe serves four, but you may see sad faces when the bowl’s empty before everyone’s had their fill. A word about coriander. Coriander is the seed that cilantro is grown from. If you don’t care for cilantro, don’t worry, coriander is a totally different flavor. It’s a bit citrusy, yet warm at the same time. I generally like to use whole coriander seeds and crush them just before using. For this recipe however, I recommend ground coriander, as it disappears into the delicious glaze. Go head and pin these Caramelized Sweet Potatoes, so you can find them easily for your holiday menus. But guess what? These delicious veggies are way more than a side dish. I’ve got a salad and an appetizer recipe coming up next week that will use them too. Be sure to put sweet potatoes on your shopping list and you’ll be all set to go! Looking for other delicious vegetable sides? These Honey Maple Roasted Carrots are another favorite of ours. I think you’ll love them as well! fresh finely chopped parsley for garnish if desired. 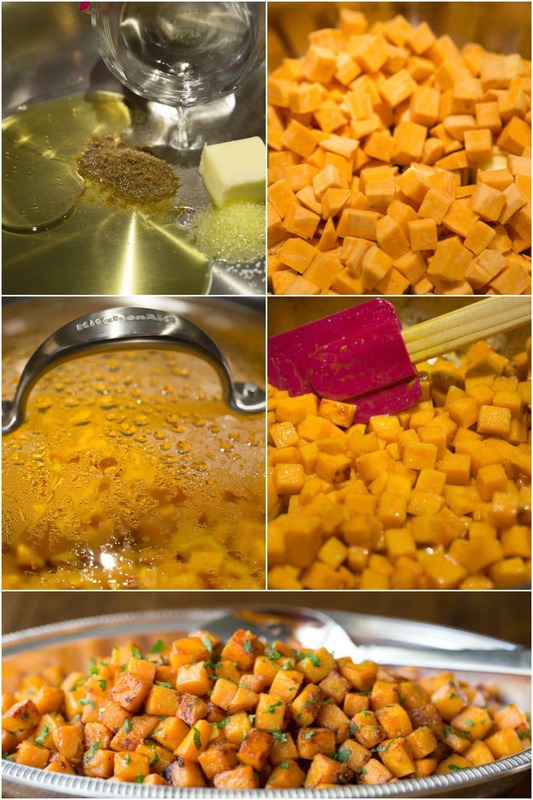 Peel sweet potatoes and cut into 1/2-inch cubes*. Combine all ingredients in a large skillet with a lid. With cover off, bring mixture to a boil over medium high heat. Stir well. Reduce heat to a maintain a steady simmer, then cover and cook for 3 minutes. Remove cover, increase heat to medium and cook, stirring occasionally, until liquid has evaporated and potatoes are tender, golden and caramelized. This will take around 4-6 minutes. If liquid evaporates and potatoes are not tender, add a few tablespoons of water and continue cooking and stirring till tender. You want them tender, but not mushy. Garnish with fresh, chopped parsley, if desired. I use my Vidalia Chop Wizard for chopping onions, carrots, potatoes, squash of all kinds, celery and sweet potatoes. One tip I recommend - I bring the top down until I feel it engage in the vegetable. Then I give it a good whack. If you do it in one stroke, it may be too much pressure for the chopper. I find I can chop the hardest, most dense vegetables using this technique. To prep ahead, just combine all ingredients in a large skillet. Cover and set aside for an hour or two. 10 minutes before meal time, uncover and proceed with the cooking part in step 2. This was really good and so easy to make! Definitely a keeper. Very tasty. Thank you for a great recipe! Yay! Thanks so much for taking the time to leave a comment! The marshmallow topped was always a family favorite, but this is my new goto recipe for any pot luck. Getting a tool to help with the Dicing was key to making this easy. That’s awesome Mike. Yes, the tool makes a huge difference! You can really taste the honey in these, I’m not a fan of honey, so next time I make them I’m thinking of using maple syrup instead of the honey. That’s a great idea Terese, if you’re not a fan of honey. Also some honeys are stronger tasting than others. Maple syrup would be delicious! I’ve never been a fan of the marshmallow topping and this is much better than zapping them in the microwave like I usually do. Thank you Sandra! Yes, I just got tired of the “traditional” fall sides and wanted to find something healthy and new. I definitely prefer these over the marshmallow topped sweet potatoes! And I love roasted squash in an autumn salad, so I bet these sweet potatoes would be a terrific addition, too! It’s hard not to like these Liz, so full of flavor! This looks terrific! Sweet, but not overly so. Love sweet potatoes, and they take so well to all sorts of different flavorings. This is my kind of dish — thanks. They’re kind of a beautiful blank pallet to combine new flavors on! Made this recipe last night for my husband,adult son and myself!! Should have doubled recipe!! Delicious..
Oh, that makes me smile on the inside and out Barb! So glad they worked for you! Though my husband is a marshmallow person, I think I will be able to sway him with the word “caramelized”. Thanks Chris! I am going to make these for Thanksgiving but I probably won’t wait that long to try them for myself. Love the cute little size, more browned bits on all those sides! I even have that great cutting gadget to use. Love these! It’s fun to do a “test run” on new recipes before the holidays, isn’t it Susan? A perfect autumnal side dish, Chris. Thanks Angie! it does check all the boxes for fall flavors! We’ve got some good ones Cheri! Stay tuned! A delicious dish for the fall season. It is perfect for fall and all the special occasions of the season! These look so beautiful! And perfect for October. They look like they would melt in your mouth. And perfect for any meal, including breakfast instead of home fries! That’s a great idea Ginny, I hadn’t thought about breakfast but now I’m imagining them with a few sunny side up eggs, yum! I can’t stand the gooey marshmallow covered sweet potato dishes, this looks so elegant and perfect! Love the coriander in there, and I will check out the Chop Wizard, I hate cutting sweet potatoes! I’m with you Jenna on the marshmallows. Do check out the Chop Wizard, it saves so much time! This will be a big favorite in our house! Can’t wait to see what you do with the salad and appetizer recipes 🙂 Have a wonderful week Chris! Thanks Tricia, I’m excited about both the salad and the appetizer. Hope your week gets off to a great start too! Yes! They look so nice on a serving platter! How funny!! I just grated a big sweet potato on Thursday on a large grate. I put coconut oil. coconut sugar, cinnamon, maple syrup, grated nutmeg and orange juice after it started to caramelize. I had made something similar in the oven with them cut in cubes but never grated on the stove top. We LOVED it. I didn’t have a name since I just made it up and never measured a thing. HA!!! This looks yummy!! I have never used coriander. Sounds like you and I are thinking alike Charlotte! Coriander is such a unique flavor for these sweet potatoes, Chris, great idea! Thanks Sue, I love the subtle yet unique flavor that coriander adds.